GMOs, Monsanto, bee colony collapse, ecology, global warming, climate change, fracking, HIV, autism, Big Pharma, medical suppression, vaccinations, fluoridation,… electoral fraud, identity chips, 2nd amendment, and so much more. But Colin McRoberts didn’t let that deter him—in fact, he started a fundraiser to attend and was soon on The ConspiraSea Cruise, blogging his experiences and delving into lectures and talks to find out for himself: Why do people believe weird things? His blog post series is featured at Violent Metaphors blog, and he spoke to me for the Token Skeptic podcast, not long after the event concluded. Colin McRoberts: I am an attorney by training, although I’m not practicing law anymore. A few years ago, probably five or six years ago now, I met my wife. As part of following her for her research—she’s a scientist and has to move around the country—I left the practice of law for a consulting practice. It was much more flexible in terms of where I could live, and I found that I enjoyed that work a lot more. These days I consult in the field of communications and negotiation, which primarily means I help my clients negotiate better deals in the commercial world. Purchasing, selling, that sort of thing. We do a lot of travel, so right now I’m speaking to you from lovely sunny Copenhagen—which actually is lovely if not actually sunny! Kylie Sturgess: How did you get involved in reporting on conspiracy? That seems a little bit different from what you might expect to do in the course of your everyday work. McRoberts: It’s actually different from what I expected to do when I showed up on the boat. When I first changed jobs I wound up having a ton of free time and caught myself just playing a lot of video games and realized that I needed to do something more intellectual to keep my brain active. I started writing a book. Originally it was a book about Creationism and I plugged away at that for a few months before I realized that I was having a hard time writing it because I didn’t care very much because nobody cares very much because Creationism is pretty much a dead issue. There are still Creationists. There will always be Creationists, but they have not as much influence as they used to and it’s not as significant an issue as it used to be. I expanded the scope of the book from just Creationism to irrational ideas generally. I’m still trying to find a better term than irrationality because that’s such a pejorative term, but generally it’s anything that is out of the mainstream that people know or should know is probably false and is promoted as true. In the course of writing this book I’ve had a lot of chances to interview people who adopt these ideas. I used to live in Austin, Texas, and we had the chance to talk to a lot of the Alex Jones crew out there. I’ve interviewed Kent Hovind, who is the Creationist and tax protester preacher, but I thought that this was, when I heard about the cruise, a great opportunity not so much to listen to the speeches and the presentations, but the talk to the people who were there learning about these ideas and to find out, Why do you believe this? What’s credible to you? How do you make this determination? My initial plan was just to go, listen, and use it as background research for the book. Tickets were pretty expensive, so we decided to crowd fund it. As part of the crowd funding I thought: you know, I’m not giving people anything; I’m not sending them memorabilia from the boat. They’re not getting a pre-released copy of the book. So, I wanted to do something to make it worth people’s time to donate: Why don’t I just blog about it from the boat so at least they get some insight into what a cruise like this is like? Because the one question I kept getting from people was, What’s it going to be like? Who’s going to be there? What are you going to hear? What are they going to talk about? I figured at first I would just write nightly updates: this is who was there, this is who talked, this is what it’s like on the boat. Obviously it got more involved than that! Partly through getting to know some of the actual reporters on board; we wound up doing something that looked a little bit more like real journalism than just this kind of daily update. Sturgess: Now the blog itself is ViolentMetaphors.com…That’s not actually your blog? You’re writing on somebody else’s site? McRoberts: Yes, my wife’s site. She’s a professor at the University of Kansas. Most of the blog is about anthropological issues, but she has a real interest in science communication, and so there’s a significant chunk of articles that are about vaccine advocacy and anti-vaccine advocacy and sort of general pseudoscience issues in one field or another. Sturgess: When I was reading the blog posts I discovered that you are one of several other people onboard, a number of reporters, not just bloggers as well. What was it like networking with this mixture of people? McRoberts: It was a surprise actually. I think I was halfway through the cruise when one of the organizers mentioned to me over dinner that there were other reporters onboard. I had already pegged one of them, Anna from Jezebel, who I had realized was a reporter just because she was writing with a very stereotypical tiny reporter’s notepad in a couple of the sessions, whereas although a lot were taking notes, they were more on legal pads. She had a reporter’s steno-pad. Then there was also a team from Popular Mechanics onboard. I didn’t realize they were there. When somebody said Popular Mechanics I thought it must be a misunderstanding because why would they be following a ConspiraSea cruise, which I think was also confusing for a lot of the presenters and to some of the guests of the cruise. It turned out they have an interest in pseudoscience and science advocacy generally, and so they had helped put a freelancer onboard, a team of reporter and a photographer. The three of them and I became friends and talked a lot after sessions and compared notes. It became very, very educational for me to watch real professional journalists approach a difficult subject like this. They were fantastic professionals, very calm, very even-handed—even in the face of some fairly unusual pushback from the subjects. Sturgess: I’ll ask you about the pushback in a second, but were there particular elements that you were keen on finding out more about while you were on this tour? McRoberts: Yeah, there were two in particular. The obvious one was anti-vaccine advocacy, which I’ve written about in the past from the perspective of a communications professional. How do you convince vaccine-hesitant parents to vaccinate? How do you relieve their fears? Why are those fears credible to people in the absence of any real scientific evidence to support them? Then also because I’m a lawyer, and that’s why I mentioned it, the pseudo-legal stuff is incredibly interesting to me. It’s something that a lot of people don’t think about and don’t realize is an issue because it’s so behind the scenes and so technical in a lot of cases. I knew there would be people onboard who would be doing things like teaching people creative ways to supposedly avoid paying taxes or to pay off their credit-card debts—none of which work and all of which eventually end up in either legal trouble, generally, or even prison time. I was very interested to see how that advocacy works. How are they pitching their ideas to people knowing that they fail, and they always fail? A big question I had was: Do the people teaching this stuff really believe that it works, or do they just teach it for a quick buck and then go home and live their lives? As I think we’ll talk about later on, it turns out that they do believe it, which was surprising to me, in that both the major teachers onboard are now in legal trouble for doing the kinds of things they teach. Sturgess: Did you have certain expectations about how a skeptical person or even just someone who would be questioning what’s being said onboard would be treated? McRoberts: My expectation going in was based on a lot of these conversations I’d had, for example, with the Alex Jones crowd in Austin, which is that for the most part people are really happy to talk about their ideas. What I’ve experienced in the past is multiple people saying you must be an agent of some kind. You must be with the FBI. You must be with—no one’s ever really said CIA, but they’ve implied it—and yet still wanting to talk about their ideas and explain themselves. Which is one reason I think we saw no skeptical questions asked at all at any point in the conference by anybody who wasn’t a self-professed skeptic. McRoberts: Even the most absurd ridiculous things. One guy told his audience the Vatican has just released enough money to pay off everybody’s mortgages and you should expect that to happen by sometime in February. Nonsense. Nobody questioned it. Nobody said a word. Just completely landed without a ripple in the audience. Sturgess: No one lifted up their hand and said, “What? Including the Protestants like myself?” Or, “Hey, I’m Jewish. Do I count?” No one even did something like that? McRoberts: Yeah, or even “How do you know?,” which is the question I would love to hear people asking more often and was never asked, never. I didn’t expect to hear it asked. It would be pretty unusual for people inside the community to ask those kinds of questions and create that kind of stress, whereas as a skeptic you can ask that kind of thing and nobody minds very much. It was actually pretty easy for us to be skeptics in the community. It was a pretty open and welcoming group for the most part, especially among the attendees. We had a couple of tense moments when people were upset that I was blogging, but they were more upset that we were blogging about the cruise than that we were skeptics. The only real pushback on ideas I ever got were people asking, “Well, you’re not going to vaccinate your kids, are you?” Really expecting me to say no, because it’s scary and just shocked to hear somebody say, “Of course I’m going to vaccinate my kids. I want my kids to be healthy and happy and strong and safe when we eventually have them and you do that by vaccinating.” I think they were really kind of unhappy to hear that, but in the sense that it bucked their expectations, not in the sense that they were hostile to it. Sturgess: Your blog posts on the ConspiraSea Cruise have been split up into different days, and people can find them on the ViolentMetaphors.com website. I enjoyed reading the blog posts—including the nautical jokes you’d be glad to hear! Most of the time I’d click over to a new page and I’d say to myself, “Oh great, he’s not blogging from a lifeboat. They haven’t thrown him overboard yet. That’s good. He’s all right!” What were some of the highlights and the lowlights of the event? Could you give us a quick brush over for those who haven’t checked out the site? McRoberts: Yeah, the highlights for me were the personal conversations I got to have with people. We had a chance to talk with just random attendees, people who were there to listen to the conference over dinner. I haven’t actually written about those because I particularly want to protect the privacy of the people who I had those personal conversations with. I’ve written a little bit about general themes that came out of those conversations. I’ll be writing later tonight about one particular set of conversations I had with a person who I won’t identify in any way to protect their anonymity, but those were extremely valuable to me in helping understand where people come from. In fact every single person I asked that question of said either explicitly or implicitly nothing would change their minds. Nothing. They almost all said well, I’ve done my research. I have an open mind and because I have an open mind, having seen the research now I’m right. Now I know that GMOs are a big conspiracy. Now I know that vaccines are poison. Now at this point, nothing would change my mind. It was a highlight for me to hear that come out of people’s mouths because if someone had told me, and people did say this is the kind of thing conspiracy theorists will tell you, I wouldn’t have believed them. I would think this just isn’t how people operate. Of course they’re going to say they have an open mind and they would change their mind if they saw good evidence. It was very valuable to me to learn that in fact there are people who will say nothing will change my mind. Now I don’t imagine that’s everybody who’s on the boat, but it was everybody that I talked to, including a couple of the presenters. The lowlights on the other hand were those very, very rare instances of hostility and even outright aggression towards me or towards the reporters onboard. I should say it was mostly towards the reporters onboard, not so much to me. I don’t know why that is. It may be that I’m not a professional journalist. It may be that I’m a guy. It may be that I’m over six feet tall and people were just less comfortable being hostile towards me, but I think I definitely had a better experience in that sense than they did. Sturgess: I guess that answers my questions about attitudes of the presenters and the attendees towards the journalists. Were the attendees generally welcoming towards the journalists? McRoberts: A little bit less so than the presenters. My experience was that the presenters were a little more cautious towards me because I was more of a self-professed skeptic, whereas the attendees were very happy to have lots of conversations with me about their ideas because I was just there to listen and not to argue with them. I think that the reporters had a little bit of the opposite experience. I think the presenters were largely there to raise the public profile, to do some speaking, to sell books, DVDs, whatever, and were relatively happy for the most part to have the press available. Whereas the attendees felt a little bit uncomfortable at the concept of scrutiny. They didn’t like there being somebody present watching them with this air of officialdom. It’s speculation on my part, but I think it’s pretty consistent with what we saw—which is people in the audience being very uncomfortable with photographs being taken or somebody taking notes for publication. Whereas the presenters for the most part were very happy with it until they started kicking us out of a couple of sessions because they didn’t want that kind of scrutiny on what they were doing, which I think is a tremendous irony of conspiracy theorists trying to operate in the dark without the visibility of the press. Sturgess: Yeah, you mentioned that on your blog, the caption for one of the photos. It’s all meant to be about transparency and understanding how the world really works, but not that much transparency. McRoberts: Yeah, and in fact as I was boarding a plane for Denmark I got an email from the cruise organizers passing along information, a request from Leonard Horowitz and Sherri Kane, they were two of the speakers onboard. They operate as a pair, requesting with sort of a legal bent to it that we remove all pictures of them and mentions of their name from the blog. It’s hard to tell exactly whether they meant it as a demand or as a polite request, but since they referenced the fact that they didn’t sign a release specific to me, I think it’s pretty fair to interpret it as a demand. It’s a completely legitimate demand. I don’t need a release to publish their names or to put up photographs for news value, but like I say in the blog, we’re bloggers and nobody foots our legal bills. So for the time being and especially because I’m working overseas and don’t have time to deal with it, I’ve taken the pictures down or obscured them and put up a notice explaining why we’ve done it. When I go back and have a chance to really look at it I’ll probably put them back up because I think it is really a legitimate request. Sturgess: What were the most attended sessions? I know that there would have been certain ones that were of keen interest to you. You mentioned in detail ones about legal matters and monetary systems and tax systems in America. I was quite surprised to see Andrew Wakefield pop up. I thought oh, he’s still around? What was it like in terms of popularity and people attending sessions? McRoberts: Well, Wakefield definitely drove the most attendance as far as I could tell. Anything that seemed like it would be entertaining tended to drive more attendees, which I think is an indication of how much of the interest in the ConspiraSea cruise even among the attendees was this will be a good time. We’ll talk about some interesting stuff, and none of it really matters at the end of the day. I think a movie got screened. That drew a lot of attendees. People talked about crop circles, things like that. I didn’t make those sessions, but I think that drew a lot of attendees because they were interesting, fun sessions. Then the biggest ones by far in my experience were the joint sessions in which Andy Wakefield showed up with a guy named Jeffrey Smith who is sort of the Andy Wakefield of GMOs and other figures. For example one panel he showed up with Sherri Tenpenny who is an osteopath who opposes vaccination. That’s the picture you saw that was obscured on my blog. They got up with the Horowitz, the Kane pair, and the guy named Nick Begich who was a conspiracy theorist, I think, active a few years ago for the most part, who was concerned about a machine called HARRP in Alaska that does some atmosphere research. I think he was pretty popular with the audience because it was an upbeat message. With me in particular, I was really impressed that he would push back against that climate of conspiracy and fear as hard as he did. It was very impressive to me to hear him do that. Sturgess: Do you think in the end that you got the answers that you sought? I think probably fairly few hands would have gone up because I think most people are very selective about the things they were hearing. They could reject the really out there stuff and then pick up on the stuff they wanted to believe and say that’s credible. I didn’t want to ask the people who believed it why do you believe it? Why is this person credible? What makes this person believable when he says something that’s so outside your experience and the experience of experts in this field? I don’t know the answer to that. I suspect a lot of it is that the people who showed up were covered with credibility by virtue of being onstage with people that the attendees did find credible like Andy Wakefield, which is kind of a shame. I think the conference organizers gave them some credibility by giving them this podium to stand in front of and the appearance of someone who is actually an expert by talking them up as somebody who knows what they’re talking about. Especially in the case of these pseudo-legal guys whose advice is so immediately dangerous, I think that’s a real shame. While I think the crew overall was very well organized, logistics were great, the people who actually handled the births and the bunks, did a great job and I want this to happen again. I think there should be a cruise like this all the time so people can talk about their ideas. I do think that was a real shame and a real failure on the part of the organizers to put up people who are as far as I can tell both under indictment before the boat started and hold them up as experts in legal matters without telling anybody, “Hey, by the way you might want to be careful. These guys are under indictment.” Of course the speakers didn’t say that. Sturgess: I don’t want to be a spoiler for the blog post that you’re writing now that the cruise is over, but what happened after? You left the boat; what happened next? McRoberts: Yeah, oh my gosh. On a personal level I left the boat with the reporters because as I said we’d kind of, the people onboard who weren’t conspiracy theorists, bonded a little bit. We went to a lovely little restaurant, I think a Hungarian place, and ate pastries and talked about the cruise and tried to explain to one of the reporter’s friends who’d showed up to give everyone a ride what had happened and just berated this poor woman with stories about the week. She loved it, but it was probably a weird experience for her too. We left in an Uber—a giant, black, unmarked SUV—all the reporters and me leaving together in a big car, which I’m sure was not good for our credibility! The conspiracy theorists, we didn’t realize that until we were on the road. Then we missed—and I cannot forgive myself for missing this, although there’s no way we could have known it was going to happen—one of the pseudo-legal speakers, a guy named Shawn David Morton who I had challenged a couple of times just because I couldn’t take any more the stuff he was telling people, was arrested as he got off the boat by IRS criminal enforcement agents. For people who aren’t familiar with American law enforcement, those are federal charges related to tax crimes. The IRS has its own branch of federal police essentially who conducted the arrest. I have no idea where they did it or if it was as soon as he got off the boat, but there’s a customs checkpoint and I assumed it happened right there. In theory, I could have been there to see it if I had gone through customs at exactly the right time, but I didn’t. We missed it. I didn’t hear about it until the news came out a couple of days later; I think searching for his name it popped up. He was arrested and out on bail I think by the time I heard. He is up for—according to the news reports I’ve read—a maximum of 600 years in federal charges. His wife has about the same indictment. Together combined they’re facing over a millennium in prison. They won’t get that much, but they are very serious crimes. McRoberts: I should say I am a lawyer. I want to add for the records, it’s an indictment. It’s alleged. He hasn’t been convicted of anything as far as I know. I think the trial is scheduled right now for some time in March. Hopefully I can be there, but realistically probably not. Sturgess: Okay, I’m in Australia and even I know that’s not right! McRoberts: Right! The first thing I thought was wait, Supreme Court cases don’t come out in September. That’s not right. Then secondly, yeah, obviously nobody has come out and said the courts are a conspiracy. That would have been mainstream news. I took a look at it and what it was, I think, a WordPress blog called SupremeCourtCase on WordPress.com—that is some guy’s ranting about his own case that Morton apparently confused for a real Supreme Court case and used that as evidence. His speech to the cruise or the cruise audience was about why you shouldn’t believe lawyers because they’re part of this conspiracy, and I thought well, this is just rank incompetence. This is somebody who’s not taking the five minutes it would take to read the case and know how the Supreme Court works. He doesn’t really believe this. Then just earlier this afternoon I was reading some of the indictment materials and the papers and the docket sheet in his criminal case and he cited it to the court in the criminal case. He relied again on this blog as a Supreme Court case establishing that there’s no jurisdiction. Which suggests to me he really believes it, which is astonishing to me because I cannot understand how somebody could spend five minutes reading this stuff and believe that it’s right. He believed it enough to stake his future on it, which is a constant surprise to me in these cases. The thing I’m still kind of investigating is where that mindset comes from. I can only imagine the howls of laughter in the prosecutor’s office when they got that document in and saw the kind of case he was trying to rely on was a blog. Just bizarre. Sturgess: Now that you’ve found your land legs, would this be something that you’d recommend for other people to try doing? Go on a ConspiraSea cruise of their own? McRoberts: Enthusiastically. They did say they want to have this again in the future. It will probably be a couple of years because the organizers primarily do New Age spiritual cruises. I think this was an experiment for them. I think they were a little alarmed at how it came out in terms of the PR and in terms of the … I think probably if they’re smart they were very alarmed to hear that their legal speakers are under indictment and they’re going to be very careful about that in the future. I hope they do it again and I hope people, especially skeptics, go as long as they go with the right frame of mind, which is to ask questions. Not to argue, not to try and convince people they’re wrong. Because I think that’s what’s really lacking even among people whose primary goal is to talk people out of being conspiracy theorists; you have to understand their mindset. You have to follow where they’re coming from, really understand what it is they want, what they believe, why they believe it. It requires having a lot of conversations that are more listening than talking with people who are conspiracy theorists. The problem for skeptics is it’s hard to find those people except online, and online is the worst possible way to have those conversations because it’s so impersonal, it devolves into arguments so quickly, especially things like Twitter where you’re really focused into just these narrow argument points and you don’t have time for that longer, more slow relationship building conversation. If you’re a skeptic and you want to talk to people about conspiracy theories and talk them out of being conspiracy theorists, you’ve got to find them. You’ve got to talk to them. You’ve got to know who they are and where they’re coming from, and that really requires a personal face to face conversation. 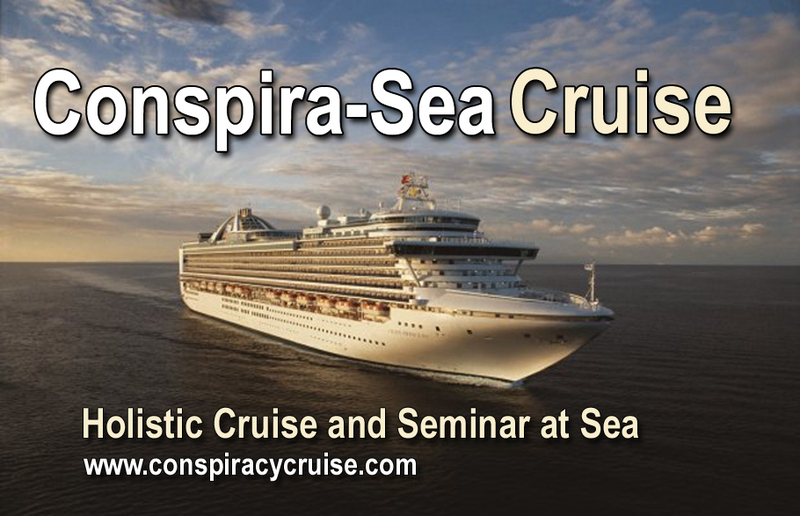 The idea of a “conspiracy cruise” is great because it makes that easy and it makes it fun. It’s a really super way to get that experience, but it doesn’t have to be a ConspiraSea cruise. Find a bookstore in town, that sort of thing, like Brave Books in Austin is where I started off having a lot of these interviews. That’s a great way to meet people who have these ideas and face them, talk to them, hear what they have to say without being pushed by the medium into this argumentative mindset. Sturgess: I like the overall message at the end of the blog in terms of it’s not us and them—it’s just us. McRoberts: Yeah. I was afraid I had pushed that a little too hard rhetorically, but I think it’s a really important point to make because that was the main message of the cruise, in a lot of ways it’s us versus them and them is Big Pharma or them is Monsanto or them is the government doing the chem trail spraying. I think the one thing that would relieve a lot of fears on the part of the conspiracy theorists is to talk to a skeptic and realize this guy is like us. This guy has the same concerns we do. This guy wants kids to be healthy just like we do. What I found is that a lot of the really most virulent anti-vaccine protesters, for example, don’t believe that. They believe that people who are pro-vaccine really truly want to hurt children. It’s an absurd thing to believe, but it makes it so much easier to believe the conspiracy if you put yourself in that mindset. Wakefield got into that mindset a little bit when he started talking about Brian Deer, the reporter who exposed him, taking pleasure in the suffering of children; I thought, that’s probably not true. I’ve never met Brian Deer, but I can’t imagine that could be true. It really makes it easier to believe you’re the victim of a giant conspiracy if you paint the other side in these monstrous demonic terms. That’s the other benefit of having these face to face conversations. This is what we tell people when they ask, “How can I convince my sister to vaccinate her kids?” The first thing you’ve got to do is have that conversation and just show up; make it clear what you believe. Be honest and sincere about why you’re having the conversation and don’t try to argue. The most important thing you can do is to say hi, this is my name. This is why I’m here. I care about you, care about your kids. I vaccinate and here’s why because it takes away from that…. It de-builds the wall, tears it down a little bit that people want to build between themselves and “them.” Because they want to believe the other side is evil and it’s time to deconstruct that as much as possible.